Aulani is part of the Ko Olina Resort Community & Marina, which features spectacular beaches, a championship golf course, shopping, snorkelling, sports fishing and more. Located on the western shore of Oʻahu about 17 miles (27.4 Km) from the Honolulu International Airport in Hawai‘i and a short drive from lively Waikiki, Aulani rests on 21 acres (85,000 m2) of beachfront property. Aulani offers Hawaiian vacation experiences with a special magic that Disney can create. Local storytellers speak and sing the legends of the islands around a traditional firepit. Traditional lei makers weave their beautiful flowers alongside you. Cultural practitioners share the elegant language of Hula. Aulani chefs serve their secrets in exclusive programs. Unique excursions, offered with special Disney touches, let all ages explore the island at a pace that’s perfect for them. 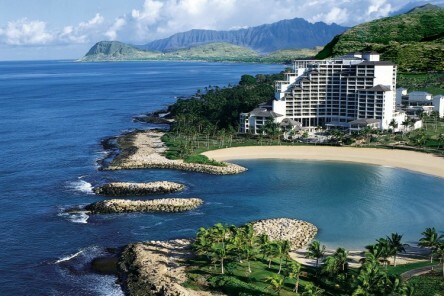 Adults can escape to explore the Hawaii of their dreams. Teens enjoy the freedom of exclusive activities created especially for them. And families savour experiences that let everyone share the wonders of Hawaii. Lead Price based upon: Standard View. For alternative room categories and rates please contact us. Special Offer: 5 Night Package. For additional room categories and offers please contact us.